One of the things I cherished most when I was a boy (and in fact well into my early working life) was reading the Sunday comic strips. I'd cut out some of the good ones and paste them onto the pages of an old telephone directory - something like a comic album. Unfortunately, comics these days have changed - they're less "witty" - and I rarely read them anymore. But whenever I reminisce and start recalling the glory days of the ol' Sunday comics, a few of them inevitably spring to mind. Here are some of my favourites. Nancy Ritz is a precocious and mischievous 7 year-old who is always critical of her lazy, orphan best friend (some say, boyfriend) Sluggo Smith whose favourite pastime is napping. Always telling Sluggo to improve himself but never once expressing her crush on him, Nancy quickly becomes jealous of other girls who pay any attention to Sluggo. One suspects Sluggo senses Nancy's affection for him - a knowledge he often uses to his advantage. An unlikely pair in every sense of the word, "Nancy" has given me some of my best Sunday laughs over the years. Blondie Bumstead - a beautiful, intelligent, responsible, calm and patient woman - is the leading lady of this comic strip. 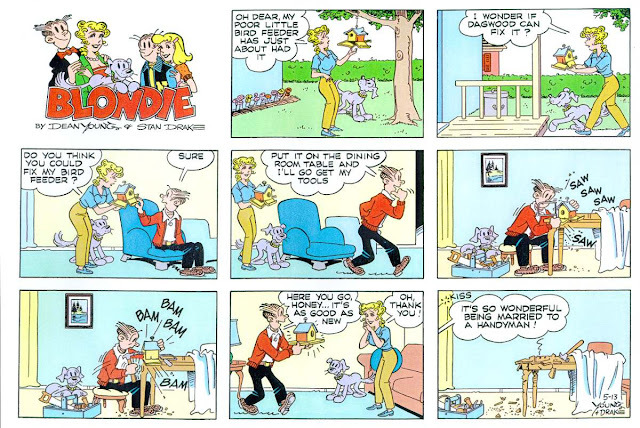 A devoted wife, mother and homemaker, Blondie unfortunately often gets stressed out and upset by those around her but more so by her husband, Dagwood, whose antics almost always form the basis for the strip, as you shall see shortly. They have two teenage children - Alexander and Cookie - who sometimes present their parents with problems one would typically expect from teenagers. It was in fact "Blondie" that sparked my interest in the Sunday comics during the early-70's, making it officially my first favourite comic strip. 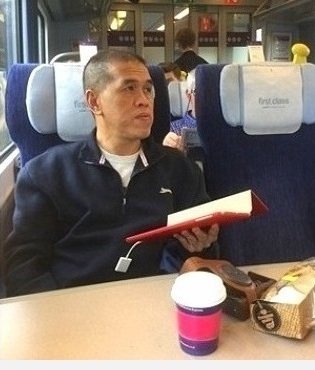 Brilliant stuff. As his name implies, lead character Brutus "Thorny" Thornapple is a born loser who never, ever gets a break; be it in his job, his family or just plain every day life. And because he's so old-fashioned, he often complains about life and things in the modern world and how these seem to be running him over. His blonde wife, Gladys, is even more old-fashioned and is totally ignorant of popular culture and sports - the latter being Brutus' favourite TV pastime. Her antagonistic nature doesn't help either and often gets the couple into arguments.... arguments which Brutus never wins. My favourite Sunday couple these two, without a doubt. The main character of this comic strip is Archie Andrews, a freckled, typical American teenager whose greatest interest appears to be girls.... and dating. He also tends to be somewhat clumsy and accident-prone. Archie's best friend, "Jughead" Jones - my favourite "Archie" character - is lazy (but bright and knowledgeable), sarcastic and has an insatiable appetite for food. Other characters in this strip include Betty Cooper (the blonde next door) and her best friend, Veronica Lodge (a nice, rich girl). Both have the hots for Archie. "Archie" is considered one of the most popular comic strips ever. A true classic. 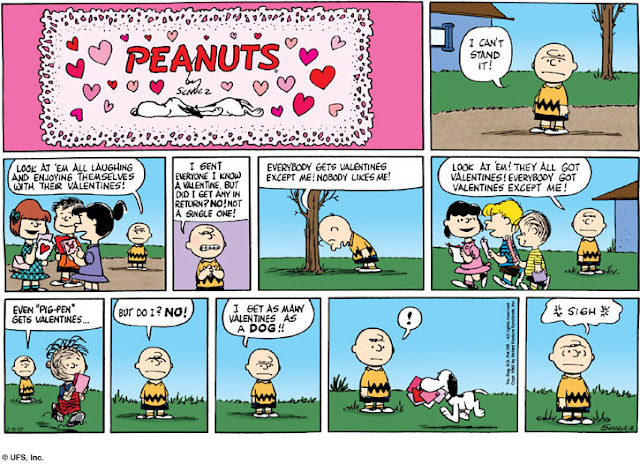 The main "Peanuts" character is Charlie Brown, a meek and often nervous lad who lacks self-confidence and probably suffers from inferiority complex. He can't even kick a football and NEVER wins at baseball. He is however a determined and persistent lad who doesn't give up easily. 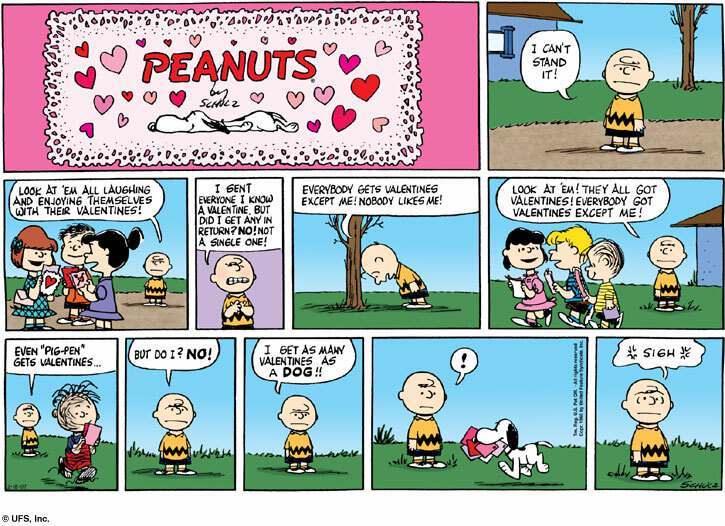 His pet beagle, Snoopy, is the other superstar of the strip (in fact, he's more iconic than Charlie). Snoopy verbalises through thought bubbles, daydreams a lot, reads, is able to walk on his hind legs, fantasises of being an aviator, plays football and even types on a typewriter. 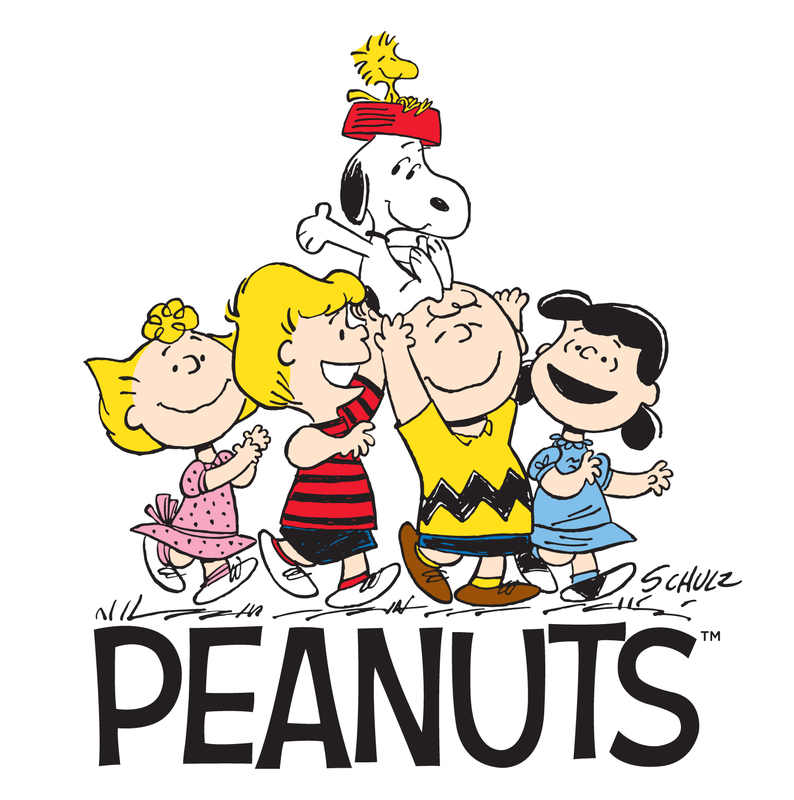 "Peanuts" is the undisputed #1 comic strip of all time in terms of popularity and influence. At its peak during the 70's, the strip ran in over 2,600 newspapers with a worldwide readership of 355,000,000 and "Peanuts" merchandise quickly became objects of desire (they weren't cheap either). By a mile, the most recognisable and biggest household name comic characters ever. "Garfield" chronicles the life of the title character - an orange, fuzzy, highly-intelligent cat with an obsession for lasagna and pasta and whose every-day is a bad-hair day. 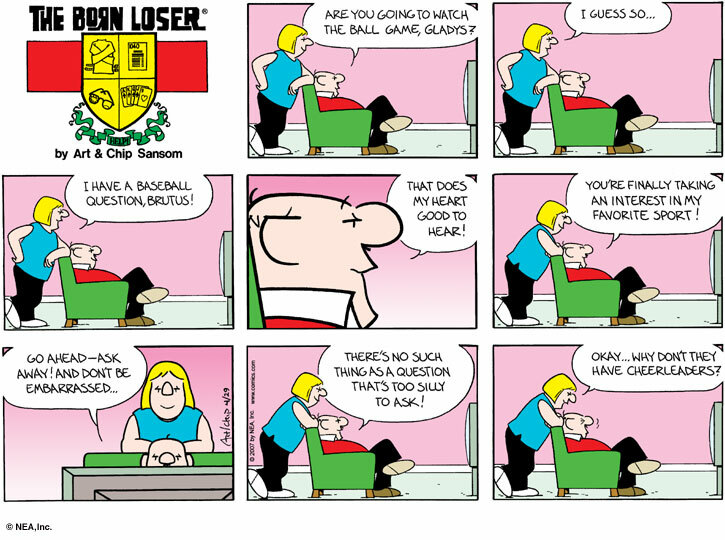 Gags in the strip commonly deal with his obesity and laziness. Roll "moody, pessimistic, sadistic, cynical, sarcastic, sardonic, obnoxious - even evil" into one and you have the world's most famous cat. Garfield's owner, Jon Arbuckle on the other hand is an awkward, clumsy geek whose eccentric interests range from stamp collecting to measuring the length of his toenails. He loves Garfield to bits but is often left feeling exasperated and wretched by his overweight cat's antics and superior intelligence. 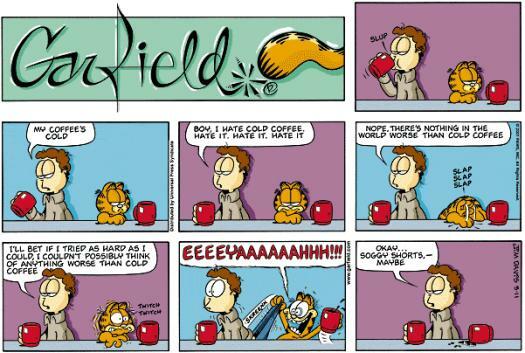 Arguably the world's most popular comic character for the best part of the last two decades (possibly even three), "Garfield" is today also the world's most widely-syndicated and franchised comic strip, making it a huge money spinner. Arguably the best comic around today. So there you have it; my Top 6 all-time favourite comic strips. There are of course many other excellent comics in the Sunday papers, e.g. "The Simpsons", "Calvin & Hobbes", "The Adventures of Tintin" and "Li'l Abner" just to name a few, but those that I've featured here are the ones I find the funniest and most witty. I hope you enjoyed reading this post - if only for the comics - as much as I did writing it. Do leave a line below to share your thoughts. Do you follow the Sunday comic strips? 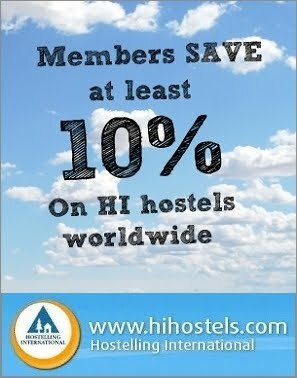 Which one(s) do you like most?